Brush fences are one of the most sought-after fence designs along the Frankston and Mornington Peninsula areas. 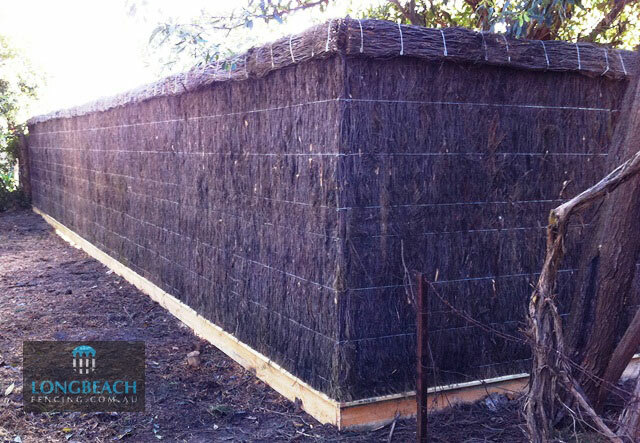 Assembled using Uncinata Melaleuca branches, brushwood is a versatile product that can offer complete privacy, natural colouring to suit your surroundings and attenuation properties for reducing unwanted noise, making it an ideal choice for any landscape. Constructed using machine compression and galvanized tensile wire, branches are bundled in even thickness across an assembly table. With an expected lifespan of over 15 years, brush fencing panels are designed as a long-term fencing or privacy screening solution that will perform well in any residential or commercial application. 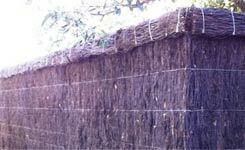 Brushwood panels are generally assembled from natural Uncinata Melaleuca branches. The species are shrubs and trees growing (depending on species) to 2–30 m (6.6–98 ft) tall, often with flaky, exfoliating bark. Brushwood panels with exposed posts, treated pine capping and single merbau entrance gate. 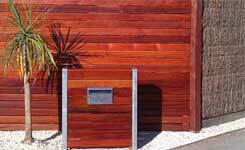 Stained feature fence using brush, horizontal merbau, exposed posts, single swing gate and letterbox stand. Stepped brush with double plinth. 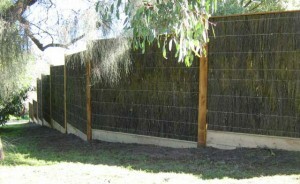 Brush panels with no exposed posts. Finished with roll-top.